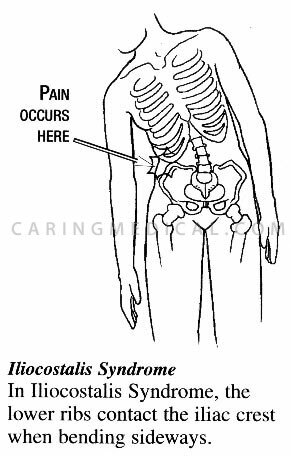 Iliocostalis syndrome is a condition caused by friction of the lower ribs against the iliac crest, which leads to irritation of soft tissues. It is characterized by undiagnosed chronic side pain. Also known as iliocostal friction syndrome, iliocostalis syndrome occurs most often among individuals suffering from osteoporosis. How does iliocostalis syndrome develop? The distance between the lower ribs and the iliac crest is normally sufficient to prevent contact between the two, even when bending to the side. This, however, is not the case with patients suffering from iliocostalis syndrome, who experience friction and damage to the tendons and muscles that insert at the iliac crest and the lower rib cage, especially when bending to the side. The syndrome is usually the result of a vertebral deformitiy that causes the ribs to move closer to the pelvis, such as scoliosis, disc degeneration or, most commonly, vertebral compression fractures resulting from osteoporosis. Since ilicostalis syndrome is usually diagnosed simply as unexplained side pain, it is typically treated with an initial application of ice, followed by nonsteroidal anti-inflammatory drugs (NSAIDs), and possibly steroid injections to reduce the swelling if the area becomes inflammed and irritation persists. Massage as well as stretching exercises may also be prescribed. 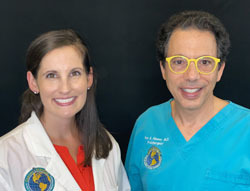 The problem with these approaches is that they do nothing to strengthen the muscles and tendons in this region and, thus, do not alleviate the chronic pain that individuals with this condition experience. Although cortisone shots and anti-inflammatory drugs have been shown to produce short-term pain benefit, both result in long-term loss of function and even more chronic pain by actually inhibiting the healing process of soft tissues and accelerating cartilage degeneration. Plus, long-term use of these drugs can lead to other sources of chronic pain, allergies and leaky gut syndrome. A better approach is to heal and strengthen the muscles and tendons where the rib attaches to the spine, as well as the fibro-osseous junction, with Prolotherapy. If muscles and tendons are pinched when the bones of the ribs and the iliac crest collide during side bending, they will have enough strength to tolerate the event after Prolotherapy. (However, it is still recommended that patients refrain from side bending as much as possible.) 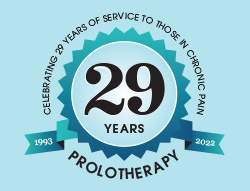 Prolotherapy is very effective in eliminating the chronic side pains caused by iliocostalis syndrome. 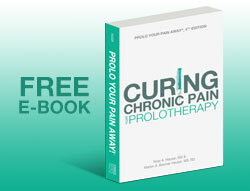 See our main page, Prolotherapy for hip pain for more information. Chronic pain is most commonly due to tendon weakness, as is the case with iliocostalis syndrome, ligament weakness or cartilage deterioration. 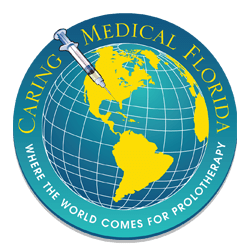 The safest and most effective natural medicine treatment for repairing tendon, ligament and cartilage damage is Prolotherapy, a specialized injection treatment that triggers the body’s own healing mechanism.